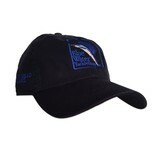 Unstructured 100% cotton twill hat with precurved visor. Cloth back strap with metal grab clasp for supreme adjustability. Blue Water Tackle Shop logo embroidered on front and Hilton Head Island embroidered on the side.